Mad Fientist:	Hey, welcome, everybody, to the Financial Independence Podcast, the podcast where I get inside the brains of some of the best and brightest in the personal finance space to find out how they achieved early financial independence. On today’s show, I’m excited to introduce Joe and Ali. Joe is better known on the internet as Mr. Money Mustache, forum moderator extraordinaire, arebelspy—or arebelspy, as I first pronounced it, probably for the first year that I saw it written down without spaces. I had the chance to meet and hang out with both Joe and Ali at Camp Mustache the past two years. I found their story so interesting and inspiring that I knew I had to get them on the show at some point. So I’m really excited that they’re here today. Both Joe and Ali are ex-public school teachers who are able to go from a $0 net worth in 2010 to financial independence last year. And they did so by building up a portfolio of rental properties that now provide enough cash flow that cover their expenses. 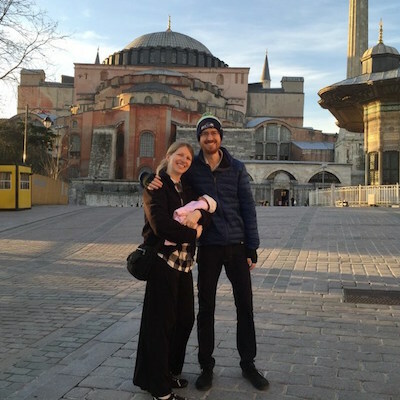 After retiring last year, they now travel the world full time with their new baby girl, Annabel, who was actually born in Istanbul, Turkey, of all places. And as you’ll soon hear, their retirement has been extremely exciting with lots of interesting things happening. So without further delay, Joe and Ali, thanks a lot for being here. Joe:	Yes, no problem. Glad to be here. Mad Fientist:	So where exactly are you, guys? Ali:	So we’re in Siem Reap, Cambodia right now. Mad Fientist:	Nice! So you are pretty much on the exact opposite end of the world from where I’m at. I’m sitting in Guanajuato, Mexico right now. So if this Skype call holds together, that would be a miracle, but you guys sound great. So you guys have been on the road for how long? Joe:	It’s been a little over a year. We early retired in June of 2015. And then we left Las Vegas where we were living in August. Ali:	We officially left the U.S. end of August 2015. Mad Fientist:	Wow! And you’ve been on the road the whole time, and you had a baby while you’ve been on the road. Is that right? Mad Fientist:	So where did Annabel join the scene? Ali:	She was born in Istanbul, Turkey, so her passport says Turkey as her country of birth. Mad Fientist:	That’s amazing. So yes, we obviously have a lot to talk about. I don’t want to jump too far ahead. So we’ll go back to the beginning, and then we’ll definitely get back into all of that stuff because it’s extremely interesting. So yes, just for people that may not know you in the community, can you just tell a little bit about yourselves? Joe:	So, I go by the screen name, arebelspy, which a lot of people mispronounce as “arabelspy” or different versions of that because it all runs together. But I’m mostly on the MMM forums when it comes to the early retirement community, but I also comment on different blogs and stuff like that. And my wife is less active in those communities, but a huge partner in getting us to financial independence. And I think it was only probably a year after chatting with you on my blog is that I realized it was arebelspy. I’m sure that’s the case for a lot of people. Mad Fientist:	That’s amazing. And you, Joe, you are a huge influence in the forums. You’re a moderator with how many thousands of actual comments? Joe:	Tens of thousands, yes. For whatever reason, I really enjoy the interaction of internet forums. So even for the last decade or two, I’ve had thousands of posts across different forums for whatever kind of hobby I’m into at the moment. At one time, it was Pocket PC’s, those old handheld, like Palm Pilot type things. And I had thousands of posts on those forums. And at one point, it was a motorcycle forum when Ali and I both had gotten motorcycles and all kinds of different various forums. But the MMM forums, I really enjoy talking about financial independence and talking about finance in general. And the sort of people who tend to seek FI tend to be, I found more, sort of engaging, interesting people like yourself, Brandon. I enjoy that type of interaction. Mad Fientist:	Thanks. It’s amazing what you do and accomplish there because, for some reason, anytime I type something, I have to re-read it like 5000 times, so one e-mail will take me about an hour to complete. And that’s why writing posts takes me so long. So to see the amount of intelligent stuff that you put out into the forum, it just amazes me every time I see it. But meeting you in person, I got a glimpse into how that all works. Just chatting with you about how many books you read and how many podcasts you listen to and things, joking that—I was annoying you by talking at 1x speed because I know you listen to everything. You’re like 2x at least, 2x speed. I’m sorry that these questions are going to be coming at you very slowly, but we’ll work through it. Joe:	[…] hear your voice at 1x because I listen to all my podcasts at double speed. So that’s a pro tip for your listeners who just want to get that content even quicker. Mad Fientist:	Yes, it’s amazing. Let’s get back to you guys and your story because it’s a really incredible one. If I’ve done my research right, you guys were pretty much at a $0 net worth back in 2010, and now, you’re completely financially independent and traveling the world. You did it as public school teachers. So, could you talk a little bit about the background? First, just schooling and stuff, and then getting to that $0 net worth. And then we’ll obviously dive into how you hit FI in record time and in impressive fashion. Ali:	We met at school, at college. And then we both got jobs as teachers in Las Vegas. Luckily, Las Vegas has a really low cost of living, but it also has a low teacher pay. So, we were living in Vegas, and we didn’t have any lifestyle inflation when we actually finally got jobs, which was really nice. So we were just living in a small apartment. We took as many extra jobs as we possibly could to start getting our wealth built up, and pay off any school debts we had. We did summer schools, Saturday schools. I got extra classes. We did clubs, and all sorts of extra things to try to bulk up that pay amounts. Mad Fientist:	That’s something that Ed Mills from Millionaire Educator, I had him on the show too, and that was a common theme that he talked about as well—not just doing the bare minimum for teaching, but actually picking up all those extracurriculars and all the different things that teachers can actually volunteer for to do. It seems like that makes a pretty big difference in the bottom line. Is that right? Joe:	The baby is very excited to hear all this. Ali:	I don’t know what I was saying at this point. Mad Fientist:	And if you’re pocketing that and investing it, then that can definitely go a long way. So you guys graduated back in 2007, I think. So Joe, you started out of the gate with 32K. And then Ali, you were doing substitute teaching, I think, for 20K, is that right? Mad Fientist:	And then all the other stuff on top of that. All the other stuff is an addition to those base salaries? Mad Fientist:	And you guys started with 30K of student debt too. So it wasn’t like you’re just coming right out of the gate and just saving and investing right away. Joe:	Yes, I’ve never looked at the exact numbers. I know I had a little over $20,000, and Ali had around $10,000 or $15,000, so somewhere around $35,000 maybe. I never really paid attention because it was automated, the payment. And the interest rate was so low that I knew we wanted to invest everything we could, and just pay it off as low as possible. That dwindled down and paid off. But yes, when it got down to $500, and my minimum payments were like $131 or something, I was like, “Man, I just want to pay this off and stop thinking about it.” But I kept going until the very last payment. I definitely feel that. So you guys, were you always good financially? Obviously, I don’t think you stumbled upon this whole fire movement way back in 2010. But were you guys good with money? Was it always something that interests you? Joe:	I was good with the math of compounded interest, but was never super good at keeping my expenses low. And especially, I had a roommate in college, we put together an eBay business that made six figures, and blew all of it. But luckily, we got over that pretty quick. And then yes, it was just keeping our expenses low at that college level. When we moved to Vegas, we got a little 400 sq. ft. condo, and lived there our whole eight years in Vegas. We just never really succumb to lifestyle inflation. Ali:	We had that same flat screen TV that he bought in college all the way through. Mad Fientist:	Nice. That’s cool. And you bought your condo in 2007, which a Vegas condo in 2007 couldn’t have been that great of an investment. Joe:	That did not turn out well. Actually, that probably segue ways us pretty good into the next question probably most people have. It’s like, “Alright! You’re teachers, and you weren’t making that much, so how did you actually retire?” And the answer is mostly real estate. So we moved to Vegas. Vegas peaked a little, ahead of the rest of the country in the summer of 2006. So then prices started falling all the rest of 2006 and all of 2007. And so in 2008, we bought a rental property. And it seemed like a good deal because the price of the property was $120,000, and at the peak, it had sold just two years before for $360,000. It sold for $360,000, and now, it’s $120,000. This is great. But then the prices kept falling. And it kept falling in 2009 in 2010. And that property actually bottomed out being worth around $80,000. So we were under water on it, but we were still making money every month because the rent was higher than the mortgage payment by a decent amount. And then so prices kept falling, and so we bought another couple of properties in 2010, and then another one in 2011, and then another few in 2012. And so we just dollar cost averaged in the properties as the prices kept falling, and we kept buying a few more and a few more. And then the prices bottomed out around early 2012, and we bought a few more then. And prices rose a little, and we bought a few more. And so we ended up with a number of rental properties. And then we pretty much initially just funded it by saving when we were both making around $40,000, but only spending $20,000, so we were grossing $80,000 plus all the extras that we mentioned—summer school and after school tutoring and everything. And living on under $20,000, we were able to save. When prices are $100,000, and we put down a $20,000 down payment, we can save that up in four, five, six months, and then go on and get the next one and the next one. And then they started to do the fun thing where compound interest catches up, and now, rents are coming in, and starts to snowball, so you can purchase then even quicker. Ali:	We sort of fell into real estate. Mad Fientist:	That’s amazing. How many units are you up to now? Joe:	So right now, we have 15 rental properties. Mad Fientist:	And those, are they mostly concentrated in Vegas, or do you have all over the country? Joe:	About a third of them are in Vegas, and the rest are spread around. After Vegas, in 2013, the hedge funds came in, Blackstone and a whole bunch of other companies. That was right around the time Warren Buffet made a comment about if he could do it at scale, he would be just purchasing a bunch of single family properties. So, a bunch of hedge funds came and started purchasing up rental properties. And prices rose quite a bit. And so I started looking at other markets and investing in other areas. Mad Fientist:	Which areas? Just curious. Joe:	Either properties or notes, in Michigan, Vermont, Ohio, North Carolina, and one other one I can’t think of off the top of my head. Mad Fientist:	That’s all right. How different is it, purchasing properties in towns that you may not be as familiar with? Joe:	It’s very different, but it’s something completely doable if you set up the right systems, if you know what you’re doing. I have a post on the MMM forums. If you Google “purchasing real estate you’ve never seen,” that’s the title of the thread, and so if you just use that exact phrase, it will be the top Google hit. For whatever reason, it’ll be within the first two or three if not the top one. Mad Fientist:	Nice, so I’ll find it and put it in the show notes. I’ll definitely link to it. Joe:	So yes, it’s called “Purchasing Real Estate You’ve Never Seen,” and it talks about how you should basically build a team of people who will be able to facilitate that transaction. Essentially, I don’t know what I’m doing in terms of—like if I go into a property, I can’t say, “That furnace is bad,” just by looking at it. I don’t have that expertise. And then I need to talk to a contractor, and he’ll say, “Here’s our estimate to fix it.” And I talk to a couple of different people. But essentially, I need to hire experts to do that. So it doesn’t really matter if I’m down the street, or I’m across the country, if it’s a property over in Atlanta, I can have a home inspector go and check it out, and e-mail me the report. I can have several contractors go out and take a look at it. It doesn’t really make a difference where I’m sitting when I’m on the phone with them or getting their e-mails. Mad Fientist:	That makes a lot of sense. How do you go about finding which markets you want to look into further? You want your tenants to be employed to be making good money. Is this a place that’s going downhill or is this a place that’s improving, that’s on the upswing? So, look at demographic reports and job growth, that sort of thing, median income. Mad Fientist:	Wow, that’s fantastic. And you’re all self-taught. You guys just trial-and-error, just took the plunge in 2007, and then just have been learning along the way. Is that the case? Joe:	Yes, lots of reading real estate books, lots of attending different real estate meet-ups and things like that. I’d say it’s a thing where there is so much information out there, starting with a couple of solid books to give you a basic overview, and then seeing where you want to go because there are lots of different areas in real estate. There are flips, there’s buying a hold, and there are so many different ways to purchase wholesale and auctions, tax auctions and just probate. There are so many different things that it feels overwhelming at first. So, just starting with the basics of, here’s a book on how to buy properties for rent. Mad Fientist:	I’ll link to that as well in the show notes to the MMM forum. That’s perfect. And you guys are mainly single family house buy-and-hold, is that right? Joe:	Yes. We’ve flipped a couple of properties that were bigger, but all our rentals are single families. Mad Fientist:	That’s cool. Is there any standout book for that sort of strategy because it seems like a great strategy for people that are wanting financial independence, to build a bunch of assets that then just give you a bunch of monthly income, which would be great. Joe:	The number one book I recommend is called “Building Wealth One House at a Time.” And it’s just very straightforward. It’s like reading Jim Collins’ book for stock market investing, but for real estate. It’s very clear language. It’s very like, “Here’s exactly what you need to do.” It’s not overly complex. At some point, once you get those basics, you’re going to want to move beyond to more advanced concepts, but that’s just the perfect beginner book in my mind. Mad Fientist:	Perfect! Thanks very much for that. That’s great. Obviously, things are much different now than they were back in 2007. Are you still purchasing properties? Are you still finding some good opportunities in certain parts of the country, or have you slowed down as far as acquisition goes and you’re just maintaining the cash flow that’s now coming in? Joe:	Yes, we retired. We also invested—our portfolio is very real estate-heavy. And so now, with all our extra cash flow, I’m dumping a lot more into equities, index funds and trying to diversify a little to basically build up a second […] via stock market investments. Mad Fientist:	That’s probably a great idea. There’s a good quote, I forgot where I stumbled on it, you had said that real estate is like throwing lighter fluid on your fire planes, which is a good, nice, little quote. Joe:	We did have a huge savings rate. I think it was around 75%. But even so, it probably would have taken another few years. It definitely sped up our time to retirement. I was on another podcast that hopefully, I won’t steal your readers over to this other podcast—listeners, I said readers. But if they’re interested in this topic, I’ve been on the Radical Personal Finance Podcast with Joshua Sheats a couple of times. One of them was discussing just the idea of, “Should I use real estate to get to early retirement or should I invest in stocks?” and the pros and cons of each. It goes into some of the downsides of real estate, and then some of the upsides in terms of early retirement. It has some huge benefits for an early retiree in terms of sequence or returns risk, and things like that. But we spent an hour-plus talking about that. And we, obviously, you and I, won’t have time to go into that right now. So maybe you could add that in the show notes, and anyone who’s interested like, “Maybe I want to look into real estate for early retirement,” I think they’d be interested in listening to that. Mad Fientist:	Absolutely! I love Joshua’s podcast. I’m more than happy to link over to that. That sounds exactly the next logical progression of people who are interested to then really dive deep into it. Joe:	And they’ll probably hear me repeat a few of the things I said here like zooming in on an area because I use that analogy. But they’ll hear two minutes of repeat content, and quite a bit of other stuff. Mad Fientist:	Perfect! Thanks. Now, that would be in the show notes as well. So you hit your number, and then you guys retired, and then you guys have been doing some really exciting stuff ever since you quit your jobs. So you guys left last year, and you started hiking at the El Camino de Santiago. Is that right? Ali:	Well, first of all, we didn’t actually hit our numbers. It’s hard to know how much we need when we’re going to be traveling, and we never really lived on the road. And having a baby, we don’t know how much that’s going to cost. So we have made-up numbers, and decided that we were going to need to work so many years to hit those made-up numbers. And then we retired a year early anyway because I was overworking […]do all those things. Mad Fientist:	And how’s that been? Have you felt that was the right call, or would you wish […]? Ali:	Oh, yeah, that was the right call. Mad Fientist:	That’s good. I think a lot of people stick around for a bit too long, and then put it off for too long, when really, I think they’d be more than fine if they just took the plunge even if they don’t feel ready for it. So that’s great that you did and it worked out great. Ali:	Yes, we always figured, you could always do side gigs. I write a little bit. I write romance novels. Mad Fientist:	You just recently got published, right? Ali:	Yes, my second book is coming out in January. Mad Fientist:	That’s awesome! Congratulations. So did all that happen after you quit, or was that something you were working on prior to? Ali:	In order for us to retire a year early, Joe and I made a deal that I would start writing, and see if I could get published, and then be able to go off early, to know that we had that. And I did, so that was part of the bargain. Mad Fientist:	That’s awesome! That’s a great strategy because I know, at least (I’ve only been jobless for the last 2 1/2 months), it’s easy to not do the things that you think you’re going to do before you quit because you have all the time in the world. It’s easy to just put things off, and wait another day to start something. But that’s an excellent strategy, to actually take the plunge a year early and force yourself to do some of these things that, in all likelihood, will earn money, but are actually challenging. You may put off a few if you leave it until after you’re fully set. That’s awesome. So you’re on your second book now. That’s great. So you’re still enjoying it as much now that it’s sort of like a job? Ali:	It can be hard to get started writing because Annabel, our baby around and everything. You just feel like, “I don’t have time to write. I’m doing this thing or I’m napping or we’re going out and seeing stuff.” But then once I get into it, it’s fun. I giggle to myself as I write because it’s romance, and it’s ridiculous to write. Joe:	And the next thing is we don’t need the money. It’s for fun. I think that’s the best part of making money in early retirement—you can do it if it sounds like fun, but otherwise, you can just not do that. But he’s like, “But look, if we don’t talk now, then you’re missing out on all these thousands of dollars, all these months that you’re not talking to me.” And I’m just thinking that’s fine. I do not need those thousands of dollars. And I’m probably not going to be too interested anyway. I completely agree. It’s a completely different mindset. Joe:	I think that last word you said, mindset, is such the key because I’m sure there are people listening to this, maybe less than the average population, but people who just don’t understand the concept of why would you turn it down? It’s still money that you can earn with very little work. The point is, there’s still a little bit of work, and I don’t need it. And that concept of enough is just such a big thing to realize like more money is not going to make me happier, but the extra amount of work will take away from the time that I have with my wife or kids, or doing this thing that I actually really want to do. So it’s more money, yes, but it still has a cost. Mad Fientist:	I completely agree. It’s actually still something I struggle with. For instance, I’m currently re-designing Mad Fientist a bit, and with the re-design, I’m going to take away all the ads because I never liked them. I don’t know what they are half the time. They could be advertising something that I don’t believe in. They make the site look stupid and terrible. So I’m planning on taking it away. But still, just turning this off this income source—and it’s not that much, it’s a few hundred bucks a month. But it’s still a tough decision because our whole lives have been spent building up to this moment and focusing on money so much that it is hard to just flick that switch. But it’s definitely something I’m getting better at. I think it takes practice to get to that point. Mad Fientist:	So yes, we’ll jump back into you guys, and see what you’ve been up to since you both quit because it’s definitely been a lot of exciting stuff. So can you just talk about quitting, and then what you’ve been up to since? Ali:	So we retired in June of 2015. We did summer school, and then we had to pack up everything, basically sell off everything, toss it to goodwill, whatever. Ali:	Empty out our 400sq. ft. apart and leave Vegas. We did all that. Joe:	—our wedding album, and that sort of stuff, in our parents’ garage. Mad Fientist:	If anyone out there hasn’t done something like that, that’s the best way to never want to buy anything ever again. I don’t know about you guys, but it’s such a traumatic, stressful, awful experience, trying to get down to two boxes that you never want to accumulate anything again. Is that how it was for you guys? Ali:	It felt so good every time I handed stuff to the people at goodwill, and just feel like I never have to look at that again. It’s no longer on my plate. It’s over. Joe:	It’s just so freeing to be like, “I don’t own things.” It’s nice. Ali:	There were a couple of things that getting rid of it was a little sad at the moment, like our Christmas tree that we bought when we were 19. Joe:	We had a little fake 3 ft. Christmas tree that we put up every year and stuff. Mad Fientist:	I just took pictures of everything that I was sentimental about, but there’s no way I want to keep for the rest of my life. That seemed to work out well because then I could still look at it and think of it if I need to but I don’t have a big Christmas tree somewhere. Ali:	Exactly, yes. We did the same thing. So then we got rid of everything except for that one little tube and our two backpacks. And then we headed out to Spain. Basically, we started in Southern France, and we did the Camino, which is a 500-mile walk across the top of Spain. Mad Fientist:	How was that? Joe:	And Ali was in her second trimester pregnancy, by the way, at this point. Mad Fientist:	No way. That’s crazy. How did it go? Ali:	It was hard. It’s walking, and yet it’s walking pretty a far way, but you’re like, “But, I walk. We’re fairly active people. We’re pretty young.” And so we thought it wasn’t going to be that hard. And then we got there. And the first day, you climb over a mountain, and you have to do in order to get to the one place where you can stop for the night. And it was so hard. I just did not see it coming. Mad Fientist:	Did you get used to it, or was it just hard day after day, and you didn’t really get into a rhythm? Ali:	The first week in particular for me was really tough, just trying to get used to it, like waking up early and packing up your little backpack and stuff. And then walking to the next place, and then having to unpack your stuff, and wash your clothes in a sink, and hang them up to dry, and try to find some place to eat. It was a lot harder than I thought. Mad Fientist:	But you finished it, and you’re glad you did? Ali:	Yes. And now, every once in a while, I’m like, “Hey, I did that.” When you get to the end, you get this piece of paper that is written in the original Latin from the Pilgrimage that people have been doing for the past thousand years, basically, from the Catholic church thing that you did this. And I have that. Mad Fientist:	Nice, and you won’t be giving that away to goodwill anytime soon. Joe:	I think the most interesting part about it for me is—so your body adjusts after about a week, and it’s no big deal physically. I did, about 20 days in, get some really shin splints that I just had to walk through. But other than that, your body does adjust, and it’s fine. The hardest part, sort of, after that period, turns out to be the mental difficulty of the idea that I have 20 more days of getting up and walking for most of the day with my bag on my back, and then getting a meal and settling in, and getting up and doing it again the next day and the next day. And I’m going to keep doing this when I could hop on a bus, and be there in about four hours. There’s always those cliché quotes about how it’s about the journey, not the destination. But with this sort of thing, it has to be because if it’s about the destination, you would just hop on a bus, and go there, and you’d be there in the final city of Santiago. We have the money to take a bus ride. We have the ability. There’s nothing stopping us from just hopping on and being there tonight. And instead, it’s going to take us 20 more days of walking. Why are we putting ourselves through this? And so, it goes past the physical thing where it’s not really physically challenging anymore, but it’s mentally challenging. Am I just going to keep doing this for really no real purpose other than the challenge of it, other than the journey? And so that to me was interesting about it. Mad Fientist:	Wow, that’s fantastic. You’re definitely excited about doing it, and you’re happy you’ve done it as well, Joe? Joe:	Yes, definitely, and just having completed it. I’ve always been lazy and self-indulgent. One of my worries going into early retirement was, “Well, am I going to sit around all day? Am I not going to get much done because I can?” And so that to me was a cool challenge to kick off early retirement because I wanted to force myself to do something difficult, so that I know I can. It sounds a little silly, but that was my thinking. Mad Fientist:	That’s great. And ever since then, you’ve just been on the road as well. So can you talk a little bit about where else you’ve traveled since then? Ali:	We went to Portugal after that. Then we went to Germany. We went to Great Britain, and stayed in London for a little bit. We went to Marrakech, Morocco, spent about a month in Croatia. And then we went over to Istanbul. We were there for three months. Joe:	So, that’s where we had Annabel. We had been mostly to Western Europe before on a backpacking trip we did one summer. One summer, we didn’t teach summer school, and we backpacked through Europe for about two months. And so we’ve been to most of Western Europe. So we wanted to hit a lot more of Eastern Europe. We saw Croatia, and Turkey, and that sort of thing. Ali:	And then post-Annabel, we went up and we did Prague, and we did Krakow in Athens. Mad Fientist:	Very cool! And how was it having Annabel in Turkey? Any why Turkey? Ali:	We knew we were going to be in the Europe area because of the Camino. And so we figured out if there was a location nearby that had good health care without being too expensive, and that we could stay for a few months because a lot of places, you can only stay for one month, or if you’re in most of the European countries, you can only be in them three months all together for all the countries. Joe:	The whole Schengen area. Ali:	So, that narrowed down our possible areas a lot. And then we just, at some point, hit on Istanbul as being a good idea. We were able to e-mail around and find a hospital with a doctor that spoke English, which was useful. And so we go over there, and the nurse doesn’t speak English or whatever, but she texted it out. We had to mime what we needed. Ali:	So I asked a question, and then she had to hand the phone over to the nurse. We were basically translating through our doctor on the phone. Joe:	So we did that and we got admitted and we go up to the little room they give us to wait until we need to go into the delivery room. And then some people come and are motioning for me to come. And I don’t know what’s going on, and I’m like, “All right.” So I go with them, and they take me down. And of course, when you check into a hospital, you need to fill out paperwork, sign in and everything. So they hand me a stack of about 20 or 30 pages of stuff, but it’s all in Turkish, and I don’t speak any Turkish. And they don’t speak any English. So they’re just pointing at it, and I’m like, “Whatever.” I assumed this is all normal. And so I’m just signing, and initialing. I have no idea what it says. I’m just signing away my firstborn and whatever. Ali:	[…] how many centimeters tall I am. Joe:	We don’t speak Turkish, and so they mime how tall. And we don’t speak metric. Ali:	And so after all of our paperwork there, it’s just completely a mess. Joe:	But it all worked out. People worry about when we first mentioned, “Hey, we’re going to be having a baby in Istanbul.” Some friends, family and stuff, they’re a little worried. Our opinion is people have babies all over the world all the time. This isn’t a new thing, so I’m not too worried about it. It will all work out. Ali:	My mom had gotten to Istanbul the day before. And so she was back at our apartment and had been there for less than 24 hours. Joe texted her that I am going into labor. So my mom has to go out in the rain at midnight, trying to find a taxi in a country where she speaks—and she couldn’t even lock the door because she doesn’t know how to do that. She just walks out with a US$20 bill and she’s just like, “Here’s the name of the hospital” on her phone. And she’s like, “Please get me there.” And it all worked fine. Joe:	You get fun adventures like that when you’re willing to go overseas and just try things. Mad Fientist:	That’s amazing. That’s a great lesson. I think a lot of people, especially in the States, are just so scared of doing anything, let alone having a baby in Istanbul. Did you guys pay cash or how did that work out? Joe:	We used a credit card, but essentially, cash. Joe:	It was around four-grand for basically the birth, the two days in the hospital, and then all the check-ups before and after, post-check-ups and everything. 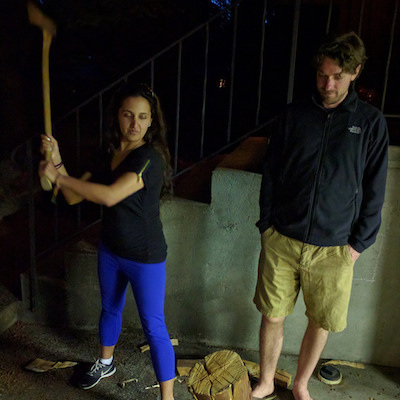 Mad Fientist:	I interviewed Mike and Lauren, and they had a baby down in Costa Rica. And I think it was pretty similar, around four grand for the whole thing. And they said it was such a nice experience. I think the baby has a Costa Rican citizenship. Is that the same with Annabel? Does she have Turkish citizenship? How does that work? Ali:	No. North and South America does that a lot, does the citizenship at birth. Joe:	So Canada, U.S., Mexico, most of South America. But pretty much everywhere else in the world got rid of that. Ali:	I think the only other place actually is Cambodia. Joe:	Yes, but nowhere else in Asia or Europe does that anymore. They used to. I think, 10, 12 years ago, they got rid of that citizenship by birth idea. Ali:	She doesn’t get anything from it. She just gets to say that her birth place is Istanbul. Mad Fientist:	…which is pretty cool. That’s a really good story when she gets older. That’s cool. So what are the plans from here on out? So you’re in Cambodia now, and I know you guys are heading to Thailand next. Joe:	Yes, we’re going to Thailand. There’s a paper lantern festival. I don’t know if you ever saw the movie Tangled. Mad Fientist:	No, but I know the lantern festival that you’re talking about. Joe:	You should. It’s good. Do you not watch Disney movies anymore just because you’re an adult? Mad Fientist:	I’ll take a look at it. I’ll put it on my to-do list. Joe:	It’s not amazing. If you don’t watch Disney movies, that shouldn’t be the one that you watch. But you should just watch them all because they’re still really good. So, there’s this paper lantern festival. Basically, they light up all these lanterns made of paper, but they have this little candles in them, and the hot air makes them float in the air, fly up. And so they just launch thousands of these, and it looks really pretty. It’s this big religious ceremony here in November. So we’re going to Chiang Mai for the whole month of November, and we’re going to see that. Luckily, we have parents who are supportive and want to come visit us. So they’re coming. At Christmas, we’re going to Bali, Indonesia, to hang out with them. And then after that, we don’t really know. We plan month by month and see what we want to do. We’re thinking eventually, we’ll probably get an RV and tour around Canada and Mexico. We’re staying out of the States for now just because it’s so much more expensive to live there with the health care, and then not being able to exclude any income. It would probably cost us around $10,000 more in taxes and health insurance to live in the States. When you’re only spending $20,000 or $30,000 for no discernible benefit to be like, “No, I’m just paying extra,” even with everything else, food and housing and everything else cost the same, we’re suddenly spending $10,000 for no real benefits. It’s hard to do for now, but we’ll probably eventually bite the bullet, and head back for a while. Mad Fientist:	So you’re doing foreign income exclusion, I presume? Joe:	Yes, just on all the extra side gig stuff, Ali’s writing and stuff like that. Mad Fientist:	And then for insurance, you’re just doing travel insurance? Joe:	Yes. So we have an international health care plan that costs about a thousand for the year for the three of us. And it’s mostly for catastrophic stuff. We haven’t actually used it, but it’s there. It’s more of a feel good safety net. But we just pay everything out-of-pocket. It’s real cheap. One of the downsides of real estate is we don’t have awesome tax in early retirement the way a lot of early retirees do who can just use 0% dividends and capital gains when they’re in the 15% bracket or less. Real estate is all unearned income taxed at a normal rate. And so we don’t qualify for any affordable care act subsidies or anything. So it will cost us about $6000 for insurance in the States versus a thousand for overseas, and then around $5000 or $6000 in taxes, extra taxes that we’d have to pay. Mad Fientist:	That’s the same situation I’m in. I was just in the States for FinCon, but then I had to hurry up and get out because I needed to do get the physical presence test, and just be out of the country for 330 days, so I feel your pain on that one. Joe:	And we’d want to be traveling anyway. I think our ideal time would probably be traveling internationally 9 or 10 months a year, and being back home 2 to 3 months. Instead, we have to limit it back to being in the States for only a month. Eventually, we’ll just bite the bullet. We’ll pay the extra money and go spend a lot more time probably touring around the U.S. in an RV or something. But for now, we’re enjoying—there are too many other places in the world we want to see now to want to just limit ourselves there. Mad Fientist:	Have you guys got tired of traveling at all? I know it is a tiring thing to always be somewhere else. It sounds like you’re spending big chunks of time in places which definitely helps. But has it been different than you expected it to be? And then we were in Kuala Lumpur last month. And our house set-up, our BnB wasn’t great. Cooking was hard, and we weren’t near any big supermarket, so trying to get the food I want to cook is hard. Everything just gets a little difficult. And it’s really hot outside. But for the most part, our travels have been really amazing. Mad Fientist:	That’s good to hear. And early retirement in general, was it everything that you hoped it would be? Ali:	Oh, yes. Just not having to work—we both loved our jobs. We both enjoyed teaching. But not teaching is just way better. Not having to do anything is just amazing. Joe:	I really liked teaching. And we actually talked about going back. In fact, Ali just mentioned two or three days ago that she might want to teach again here—maybe next year, maybe the year after. But teaching is such a fulfilling job. But also, we taught for eight years. And to me, eight years is long enough to do everything. Even if you love teaching, which we did, we also love travel, and we also love being home with our kid all day. And so there are all these different things that it’s like, yes, we really enjoyed that, but we also want to go try other things too. So, early retirement, financial independence in general, just that ability to be like, “Now, I want to focus my life on this aspect,” is incredible. Mad Fientist:	That’s awesome. I usually end all my interviews with a question like, if you had one piece of advice for somebody who wants to pursue financial independence, what would it be? And I’m sure some of your listeners are like—I bet there are other people who would do that same thing because there are so many different good tips and your podcast guests have had a bunch of really good tips. And so basically, he says, instead of trying to be happy by getting all this stuff, I want to be happy just having what I have and limiting my desires. This is simplicity and that sort of thing. For me, financial independence was really easy to get because we were happy just living in our fairly small place and eating at home and just being efficient with how we spent money. And so our high savings rate was just because we enjoyed simplicity. And we didn’t have to cut our budget .We didn’t have to deprive ourselves. If you can cultivate that mindset of, “I’m just going to limit my desires rather than trying to satisfy myself with all this different stuff,” I think that really helps you become financially independent because 1) you don’t need to spend as much money while you’re earning and you can save a bunch, and then 2) you don’t need as much when you’re retired. Ali:	So many people would always say things about how we sacrifice so much to get to this point. We’re constantly sacrificing. But there was no point in our lives in Las Vegas that we felt like it was a sacrifice to live in a small apartment, to only have one car. We cultivated a concept of gratitude about everything. And once you’re grateful for everything you have, to try to get more seems silly. When you’re grateful that you have this one car that I got when I was 16, just being so excited about that fact that I have this car, it’s like we don’t need to get a brand new car or that we have this place to live, or we have these places that we can spend time together. We don’t need all that other extra on top of it that costs money. Mad Fientist:	That’s a huge, huge point. And yes, that’s something I’ve been thinking a lot about over the last few weeks just because I have a buddy back in Scotland and he’s the complete opposite with money. But he’s really interested in what I’ve done. He’s the guy that designed my logo, so he’s worked with me in Mad Fientist stuff and things like that. He’s a really good designer and things like that. It’s just so hard to get across because every time he sees us, he thinks we’re depriving ourselves and we’re just doing it just because we’re cheap or we’re frugal or we’re just miserable because of it. I was trying to think of a good way to explain to him that it’s not that at all. It’s limiting ourselves actually makes us happier. And when we do experience something that we only do so often, it’s that much more enjoyable than if we did it all the time. Mad Fientist:	Seriously, Ali, that’s your tip as well, you would agree with Joe on that one? Ali:	Yes, definitely about being grateful for what you have, and just understanding enough, and just cultivating that in your life. Mad Fientist:	Awesome. Well, this has been fantastic. If people want to get in touch with you, what’s the best way? Obviously, they can reach you on the forums, but you also have a blog, AdenturingAlong.com that people can maybe get in touch through? What’s the best? Joe:	People kept telling us, “We want to follow along with your adventures and your travels. You should set up a blog.” And so we finally, reluctantly, did. It doesn’t really have much content, and I don’t know when or if that will change because blogging feels like something we should do, but then it’s also one of those things that’s like you need to get motivated to write these posts. And there’s all this other stuff that we’re doing too. But really, you can e-mail us through there. If you actually want to get in touch, e-mailing me is a good way or go on the MMM forums. I’m on there all the time. Feel free to reach out. I love chatting about financial independence and real estate, teaching any of those things. Definitely, I spend a lot of time talking about that online. Mad Fientist:	That’s awesome. And I’m excited to check out the Radical Personal Finance Podcast as well with you. I don’t tend to listen to any other interviews before I do an interview because I don’t want it to influence my questions at all, but it definitely sounds like a great carry-on from this, especially if you’re interested in real estate for FI. Mad Fientist:	Cool, guys. Well, have a great time in Siem Reap. It’s such a fantastic place. And I really appreciate you taking a whole hour out of your exciting day to chat with me. It’s been great, so I really appreciate it. I look forward to hopefully seeing you guys at Camp Mustache next year, and maybe before actually somewhere in Southeast Asia or something. Ali:	Yes, that would be great. Thanks for having us on. Joe:	Good talking to you, Brandon. Mad Fientist:	Thanks, guys. Bye. I had no idea Joe started a blog. This is awesome. That’s a great podcast! So interesting to hear they’re story after reading so much of what Joe wrote in all of the forums over at MMM. This is a great example of hustling (in addition to lower paying jobs) and finding what works to accelerate you to FIRE! Congratulations Joe and Ali. Everyone can enjoy the enthusiasm you have share for life. Simplicity and a high savings rate are the “secrets” if they can be called secrets at all. I was left feeling like your outstanding Real estate opportunity, some 30 cents on the dollar, isn’t readily repeatable unless another housing crash comes, and if or when another bubble does pop, how risky would it be to have 15 properties as a FIRE portfolio in the first place? I don’t want to buy property at the top… are we there yet? Love the last parting advice about FIRE and happiness. Agreed, RE at these prices is scary! Great timing though! Haha, I pronounced his name “ah-reh-BELL-spee” for the first several months I was on the forum! I finally saw an explanation of the name in a post somewhere and felt silly. I’m hoping the Australian Real Estate market cools down a bit so I can jump back in at a lower price. But it’s so hard to call the top. The prices could go up for another 5 years. Who knows right? Great idea! How do you listen to this podcast at 2x speed? Would it even be safe to try to absorb to Joe/Arebelspy’s thoughts at double the already-unusual pace at which he delivers them? Joe- You and Ali should teach in Thailand! Combine your loves! Great podcast…didn’t realize it was “Arebelspy” from MMM forums until I started listening to it. I’ve learned a lot from reading his forum posts. Specifically the one about buying a rental house without seeing it…because that’s what I ended up doing. Hearing him do it and explain how it’s done gave me the confidence that it was possible and not stupid of me (which is what many people said). Wonderful podcast, thank you for the refreshing take on simplicity and gratitude! Hi! Apparently Personal Capital need a valid US phone number to create an account.. You guys have some suggestions to foreigners? Something that would work for Brazilians if I’m lucky? Another fantastic and entertaining podcast Mad Fientist!! So glad they did it! WOO! Thanks for interviewing them. I always love hearing teachers on your show. Call me biased. ;) Makes the FI goal/dream more realistic for myself. I’d be interest to know what city in Ohio he owns real estate and if he still thinks it is a good time to buy. I have a couple in Ohio myself. Just started the long journey. But i think i have the plan and a system. Great work! (All three of you) The freedom alone must be awesome. I’ve always dismissed the rental income route, but you’ve laid out so many resources here, I might have to take a peek into it. And for what it’s worth, I stumbled but did get it as ‘a-rebel-spy’ the first time :) Thanks for all your great contributions to the MMM forum. What are the titles of Ali’s two Harlequin books? I’m just getting started on really working to achieve FI in the next ten years! (I’m starting late (50), but motivated). PS love the website, and just signed up for the Podcast! Thanks for the interview, I found it very interesting. However, I’m having a hard time wrapping my head around their situation. To put it simply, they’re retired but they own a bunch of financed rental properties? I understand that they have more cash flow than liabilities every month, but at what point does the risk of being on the hook for 15 mortgages come into play? 15 properties, but only 4 with mortgages. 13k+ in gross rents each month, less 2k/month in mortgages. 20% LTV (loan to value) on the properties on average, meaning that if we were buying all our properties today, it’s like we put down an 80% down payment on the portfolio as a whole. To put it another way: we could have 12-13 of our 15 properties empty, and pay the mortgages with just 2-3 of them rented, and live off of other saved investments for years. Sorry it wasn’t clear in the podcast about the number of mortgages! As far as the mortgages themselves, we could pay all of them off if we sold other (paper) investments, but prefer to keep the mortgages, and invest our money elsewhere instead of paying them off–it’s low-interest, fixed debt which acts as a hedge against the US dollar, and I prefer to diversify more, and keep those mortgages. Thank you for that clarity Joe. I have 2 rentals at 20% ltv. Looking to add more but the market is scary. I look forward to reading how you did that. I’m an appraiser and realtor, so its in my wheelhouse. Love following you on the MMM blog. Any links that would help explain your path to having them at zero note further? very insprirational always wanted to get into real estate now im ready well done!! This was a very inspiring conversation. I’m a teacher on the road to FI, but real estate has always intimidated me for various reasons (I’m in a HCOL area, then all the headaches and fees that go along with paperwork involving real estate are kind of overwhelming). I’m sure there’s a MMM forum topic on newbie real estate investors in HCOL areas, just need to check it out. At the moment I’m content throwing 60% of my income into my portfolio. The lighter fluid analogy is very tempting, though!